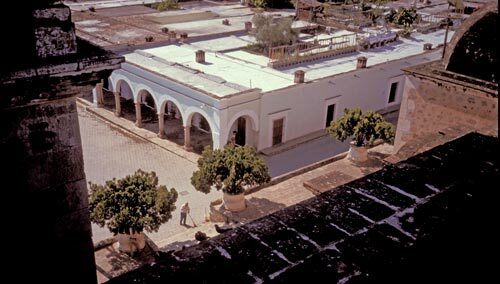 For the past 300 years Alamos has been built and shaped by families of wealth and taste. 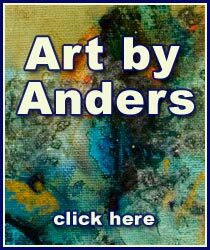 Experienced builders and skilled craftsmen, through good times and bad, have gone about town building and restoring ruins. Today it is a National Colonial Monument, an ageless tribute to the men and women who entrusted their designs, possessions and dreams to the future. Another brilliant sunrise in an endless parade of days into centuries. The Sunday promenade in Plaza de Armas goes back to the 1680’s. In peaceful times families gathered here for conversation, worship and grand public celebrations. The church and prominent colonial mansions were built surrounding the plaza for protection against the Indians: Tarahumara, Yaquis, Mayos and Apaches. Later, the plaza afforded a prestigious address. 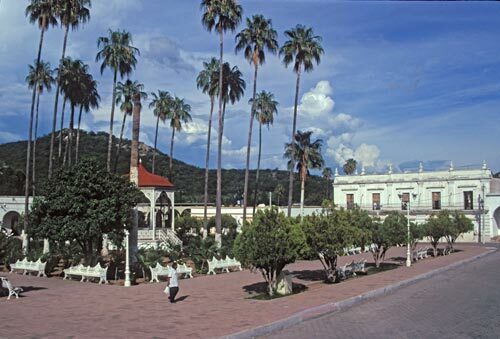 The Alameda, the commercial center of Alamos, was laid out in 1769. With prosperity came hardship. The poor could not afford the inflated prices of merchandise shipped by pack trains from Guadalajara and Mexico City, a hazardous trek that took four months. Indians were used as slaves or cheap labor. Sanitation and disease were a problem: in 1770 alone plague wiped out 6,000 people. Summer afternoon in the Plaza, two story Hotel Alamos is in the background. There were continual power struggles between Colonels, Governors, Admirals, Priests, Bishops, and an unending parade of Royal emissaries. The city was heavily taxed by the Crown and by those who controlled the local territory. Political instability raged, treaties and agreements were broken. Alamos had its ups and downs depending on the mood of the day, month and seasons. 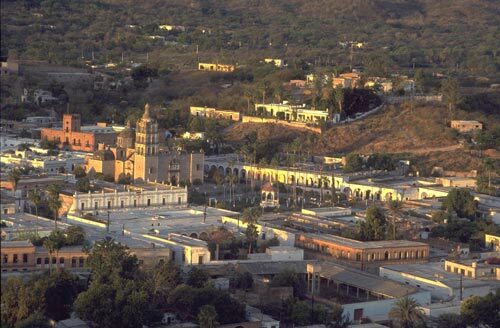 Alamos endured two centuries of siege mentality and the prize was control of silver and politics. At one time or another the plaza was overrun by the Spanish, Mexican colonists, Federalists, Liberals, French, Apaches, Independents, Reformers, Pancho Villa, Renegade soldiers and bandits. Along with droughts, pestilence and floods Indians continued constant uprising. Apaches came south to plunder and the independent Tarahumara sought revenge for their forced slavery. By 1849 only 4,000 people remained in Alamos. The miners had left for California’s gold rush. Trade shifted from El Camino Real to coastline ports. Plazas, arches, ornate ironwork, hand carved wood, high ceilings and cobblestone streets fell upon hard times. Roofs caved in leaving two to five foot thick walls open to the sky. The once great patios filled with debris. Despite the wars, bad weather and impoverished neglect. old families stayed, as did some miners. Alamos continued on… the sun would rise another day in this land that remained in a forgotten age. 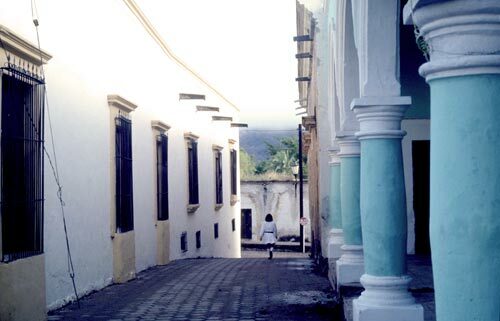 The streets of this National Colonial Monument echo history, here, one is never alone. The Plaza is peaceful these days. Alamos streets are safe from intruders and invaders. “Here is something Special”, Spanish explorer Vasquez de Coronado noted in 1540 as he headed north, passing by tall white rocks on Alamos de Sierra. This is the opening chapter to “A Short History of Álamos” written, filmed and edited by Anders Tomlinson. Narrated by Bruce Miles. Soundtrack by SonicAtomics and Estudiantina de Álamos. Álamos shares a strong maternal bond, steeped in history, with all the Southwest. Juan Batista de Anza arrived and departed from Álamos in the spring of 1775 with silver, and local families, to settle “Monterey and the Californias”, including San francisco. Another expedition, five years later, left Álamos to settle Los Angeles. The conclusion to a Short History of Álamos, Sonora, Mexico embraces the Sierra Madre. Here, Bishop Reyes’ Cathedral in the Plaza, a three-tiered belfry, shines gold in morning light. Here, looking east, one’s imagination is stirred by the forbidding beauty of the Sierra Madre Occidentals. Together, they shape the Álamos experience. This page took 0.339 seconds of computer labor to produce.